Delphine Rodrik Ko at work on his start-up in the iLab, after most have cleared out for the evening. George C. Ko ’15, aware of his luck and holding tightly to it, is an entrepreneur—a businessman, a dreamer, a musician of sorts. But standing outside of Lamont on a Sunday evening, he does not look much different from the other students who hurry past. He wears a black zip-up hoodie with a Harvard crest on the right sleeve, a heavy backpack hanging dutifully from his shoulders. It’s 5:20 p.m. on the dot, and he’s looking at the shuttle schedule on his phone. The bus that runs between Soldiers Field and the Yard usually comes by Lamont at this time every week, he says, but when he calls the shuttle service he learns it won’t today: It’s Easter. Ko has some work to do at the Innovation Lab—he’s designing the beta site and functionalities for a multi-platform app, and he has a meeting to prepare for by Friday—so today it looks like he’ll walk. Ko tries to go to the iLab weekly, but this term, with an even busier course load, it’s been difficult. Last semester he was pulling around three all-nighters a week, and ended up at Starbucks so many times that he accumulated a Gold Card that now earns him free drinks. Besides serving as director of business development for Politoscape, the start-up that he co-founded, Ko is also part of the Harvard College Piano Society, where he is working to start a program that will bring professional artists to the Harvard community and the greater Boston area. His goal is to graduate from Harvard with an education that extends beyond the library. “I think it’s better to go this way,” he says, crossing the Weeks footbridge, and turning left on Soldiers Field Road. Past the Business School’s iconic campus—brick buildings and white trim, green lawns and flowering trees—and closer to Allston, Harvard’s nearly six-month-old Innovation Lab sits on the edge of a large, industrial parking lot. Ko swipes in at the front door, entering into the same lobby Mark Zuckerberg toured in November. “I can totally understand why people like Bill Gates and Zuck dropped out,” Ko admits, citing the around-the-clock time commitment required to build a company. But the mentors Ko has found among teachers, iLab connections, and other professionals have been trying to the myth of the entrepreneur dropout: the romantic idea that a student must forgo a formal education to become a successful entrepreneur. The iLab is one of many recent University efforts to encourage and foster student innovation on campus. Five years ago, Fortune Magazine reported that 3,000 colleges and universities had already provided their students with course offerings in entrepreneurship. Most recently, Faust’s inaugural President’s Challenge demonstrated the University’s increased emphasis on student innovation coupled with an undergraduate degree, and hints at the evolving definition of a modern liberal arts education. White-haired and wearing thin-rimmed glasses, Lassiter specializes in entrepreneurial management at the Business School and serves as the Faculty Chair of the iLab (“You’re supposed to rise when you say that,” he jokes). What constitute a real change in entrepreneurship’s significance, however, are the shifting prices and risks associated with “starting up” a new project today, especially those in consumer internet-based sectors. Lassiter cites globalization, shifting global politics, and the opening of different markets as contributing factors to the greater feasibility of innovation in business. It’s exactly these changes that have created a new niche of students on campus who are fascinated by entrepreneurship. This fall, Lassiter aimed to address the needs of this group by offering a new General Education course, United States in the World 36: “Innovation & Entrepreneurship” American Experience in Comparative Perspective,” which he taught with HBS professor and course head Mihir A. Desai. The popular course enrolled two students below its 95-person limit. Marc F. Atiyeh ’14 thinks USW36 is the best class he will ever take at Harvard, and stresses the need for more classes that focus on the case-method approach associated with the B-School. Atiyeh’s views on learning entrepreneurial skills in the classroom are grounded in a country far from Cambridge. “I’m going to talk quickly about myself,” he blurts out apologetically. In Lebanon, his home, it’s hard to make a living if you’re not an established doctor, lawyer, or engineer. That’s why Atiyeh had originally wanted to go to MIT—to learn the practical, technical engineering skills he expected he would need in the future. But Atiyeh decided on Harvard because he thought it would provide him with a better network. “Everyone always says, ‘It doesn’t matter what you know, but who you know,’” Atiyeh explains. At home, simply saying that he studies at Harvard earns Atiyeh headlines and attracts public attention. In February, it gave him the opportunity to present his international SAT-tutoring company, Help Me Get In, on “Min El-Ekhir,” a talk show on MTV Lebanon. “So I am leveraging my education at Harvard to help these students [through my start-up],” Atiyeh says. The app created by Vladimir Bok ’14, who also took USW36, performs some of the same basic functions as HeyTell, he admits. “But have you seen HeyTell? What does it look like? It looks like garbage, right?” Visibly proud, he takes out his smart phone to demonstrate Coco Voice’s capabilities—it is better, you have to admit—scrolling through different conversations, sending voice messages to his most recent contact as an example. Bok enthusiastically relates the University’s cultivation of students with entrepreneurial potential; he himself is an example. “The story goes that people go to Harvard wanting to change the world, but leave going into I-banking or consulting and wanting to make money,” Bok laughs. “In my case, it’s the opposite.” Bok was interested in a financial track, but meandered from that path after his freshman year. Taking Computer Science 50 last year sparked his interest. Through a networking event at the iLab in November, Bok met his business partner, a statistics Ph.D. student at Harvard who had developed the original prototype for Coco Voice. In an entrepreneurial setting, changing paths, taking risks—the possibility of failure—all are associated only with experience. Having such opportunity in the absence of other obligations is particular to being a student, and “it’s a tremendous time to do it,” says Lassiter. His grin breaks the solemn earnestness with which he usually speaks, and you believe that it’s almost possible, that he probably could. The enthusiasm of students like Atiyeh and Bok reflects an attitude that, according to School of Engineering and Applied Sciences Lecturer Beth Altringer, stems from an increasingly accessible cultural narrative that traces young adults, even teenagers, starting successful businesses of their own. It’s the extreme underdog story, the screenplay of “The Social Network,” in which a savvy dropout still makes it big. Recognizing that entrepreneurial students would benefit from institutional support, Van Vuuren and venture capitalist Patrick S. Chung ’96, along with their faculty adviser, SEAS professor David A. Edwards, launched the Experiment Fund this past January. The seed investment fund aims to offer financial support to projects created on college campuses like Harvard’s, and to incentivize continued connection to Cambridge as a hub of technology and innovation. Now working for a growing tech company, Tyle likely won’t need a Harvard diploma to move onward and upward: “At the end of the day it’s about a story you’re creating, more than about the classes you’re taking,” he explains. Tyle’s story seems to fall into the myth Altringer describes of the young and instantly successful entrepreneur. Unlike Altringer, Tyle does not believe a formal education is essential to entrepreneurial success. “The only way to learn about entrepreneurship is to actually do it,” he says. “It can’t come from a book, it can’t be taught.” And, although Tyle attributes much of his maturity to his experiences here as a student, he says that he has learned more in the past five months away from Cambridge than he has in his life. Like Tyle, Max D. Novendstern ’12 decided it was necessary to take time off to devote all his energy to the internet start-up he co-founded, CommonPlace, which is dedicated to building up a local community network. Novendstern chose to leave because he doesn’t believe that you can experience this change in focus as a student. “The challenge of Harvard—of impressing TFs in section and reading through class syllabi—became much less interesting” he laughs. But he “100 percent plans” to come back and graduate, citing figures like Paul Farmer and Lawrence Lessig as the “archetypes for the 21st century activist,” the perfect combinations of entrepreneurship and Harvard: people who study the effects of the actions they propose. Academia, he says, forces us to consider the serious questions students must solve: “If you can’t point to a book that addresses the problem you’re working on, then there’s a good chance the problem’s not worth your time,” he says. After starting a type of turbo-tax program for student loans for a CS50 project last year, Zach M. Hamed ’14 was determined to pursue this work, initially through the HackHarvard incubator program, of which he is now on the Board, and later throughout the summer. The project, however, ended up merging with another start-up that was working on a similar idea. When Hamed was offered a position on the condition that he take time off from school, he turned it down. A proponent of all the ways in which the University has been moving toward a focus on innovation—the iLab he frequents, the classes he takes, the resources to which he often turns—Hamed still thinks the University could do more. Harvard does not provide enough funding, or academic support, to allow students to comfortably pursue these options while still remaining students. 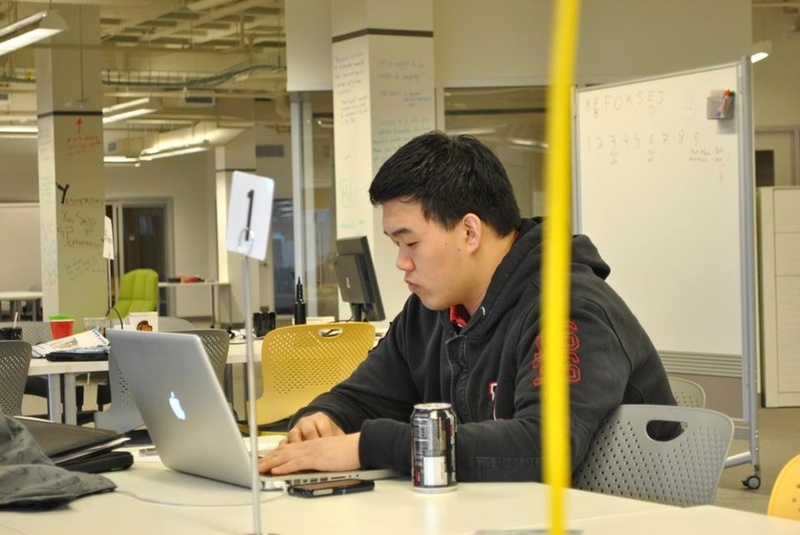 “Give me a way to work on a start-up, so that I don’t have to drop out of school,” he says. There are the outliers, of course, the students who seem to find their way into entrepreneurial paths out of instinct and who can balance it all. When Annemarie E. Ryu ’13 arrives at Quincy dining hall, she is enthusiastic and well-put-together—straight brown hair, a white button-down shirt, a comfortable smile—but she’s a bit tired, you can tell. “It’s been a long day,” she confesses. She’s just returned from New York, where she attended an official reception as one of Glamour Magazine’s Top 10 College Women of the year. Ryu’s most recent project is called Global Village Fruits, a company that aims to import jackfruit to U.S. grocery stores, providing more income for local farmers in India. Although Ryu calls herself a social entrepreneur (“My main motivator is the benefit of others”), this venture is what she pegs as a more “profit-oriented enterprise,” sparked when she tried jackfruit in a market in India last summer and was shocked at its surprising flavor. Ryu’s pitch was strong enough to get Whole Foods on board; jackfruits will be sold in this franchise and other stores within the next few months. Ko’s start-up, Politoscape, grew out of a last-minute change of heart he experienced while developing his final project for Altringer’s class. Weeks before the class’s deadline for a prototype for the final project, Ko’s group developed a new idea: to counteract the political echo chamber that characterizes the 2012 elections by helping people broaden the scope of sources they access for political news. Months after the final proposal, as this Sunday afternoon comes to a close, Ko is still working on the project. Ko walks into the iLab and through the space—past circular conference rooms, the “student-venture pods,” the multi-purpose classroom where desks can be rearranged into different formations for group activities. The sun is just beginning to set over the arches of Harvard stadium, visible from the horizontal windows at the end of the building. The motion-sensing lights in another section of the room flicker off, and a few others in one of the conference room are all that remain. The iLab is emptying, but Ko is just setting up for the evening. He opens his computer, takes out his phone to place a call (“I’m at the iLab now, do you want to stop by later?”), and pops open a Coke. Next is concentration. The following day, he’ll find out that he has won a Gov 2.0 Grant from the Institute of Politics, allowing his team to further develop Politoscape in even less time than was previously planned. For now, the cleared work tables, the rows of white boards covered with diagrams and equations, the momentarily unoccupied chairs—all stare back in anticipation. —Alexander J.B. Wells contributed to the reporting of this feature.